Union Minister Arun Jaitley on Thursday resumed charge of the ministries of finance and corporate affairs after a nearly 100-day gap during which he underwent a surgery for kidney transplant. 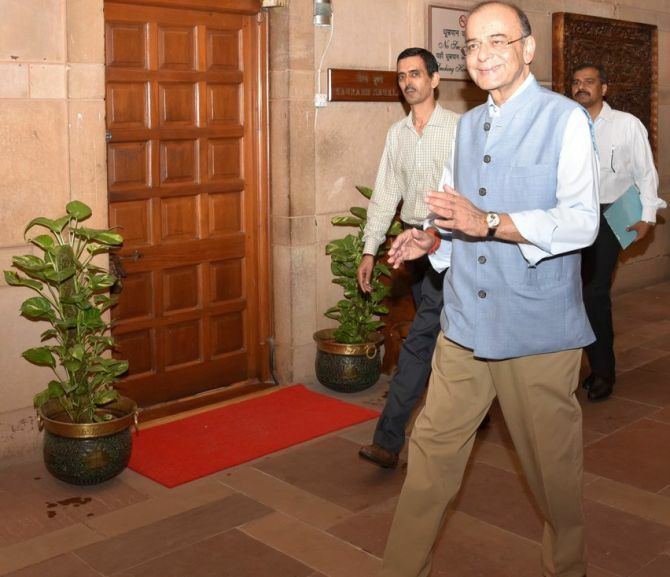 Jaitley, 65, who had stopped attending office a month-and-half before the May 14 renal surgery, came to North Block -- the seat of the ministry of finance and the ministry of corporate affairs -- at 1100 am in his white Tata Safari accompanied by his personal staff. Attired in formal trousers and wearing a characteristic smile, Jaitley went straight to his first-floor office, which had been renovated and sanitised to suit his present condition. He was greeted by a host of officials and his deputies. He acknowledged them with folded hands and also waived at people waiting for him. Jaitley started work after getting a clearance from his doctors, official sources said. 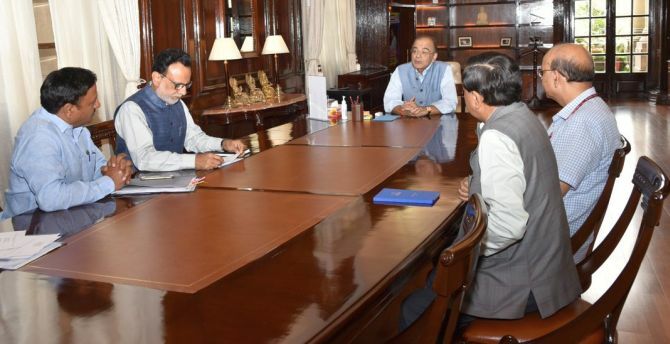 He met senior officials in both the ministries including Finance Secretary Hashmukh Adhia as also the chairpersons of Central Board of Direct Taxes and Central Board of Indirect Taxes & Customs. Sources said doctors have advised him to cut his public interaction to the minimum to protect him from contracting any infection. The limited visitors to his room are required to cover their shoes with the blue plastic bags that are used in hospitals. Jaitley had undergone a renal transplant operation on May 14. On that day, the charge of his ministry was given to minister for railways and coal Piyush Goyal on an interim basis. Jaitley had remained a minister without portfolio in the Narendra Modi government since then. He has been the finance minister since the Modi government came to power in May 2014. He had also held additional charge of Ministry of Defence as well as that of Ministry of Information and Broadcasting. During his over four-month-long break, he was active on social media, writing blogs on economy as also various issues of national importance such as National Register for Citizens in Assam, Emergency of over four decades ago, No-confidence Motion in Parliament, Rafale fighter jet deal and the Goods and Services Tax. He also participated in a couple of events like banking conclave and the first anniversary of the launch of GST through video conferencing. He even held at least one meeting with ministry officials through the same mode after the surgery. He made his first public appearance in Parliament for a few hours to participate in the election for the Deputy Chairman of Rajya Sabha on August 9. Later he also participated in the prayer meeting organised after the death of former Prime Minister Atal Bihari Vajpayee. A Rajya Sabha MP since 2000, he was re-elected to the Upper House from Uttar Pradesh in March this year. He is also the leader of the House. Jaitley had undergone a bariatric surgery soon after the Bharatiya Janata Party government came to power at the Centre in 2014. The surgery, to treat weight gain that he suffered because of a long-standing diabetic condition, was first performed at Max Hospital, but he then had to be shifted to AIIMS because of complications.